It’s the first Wednesday of the month, folks, and that means it’s time for a gathering of my friends in the Insecure Writers Support Group. Here we share our fears, our anxieties, our hopes and dreams. 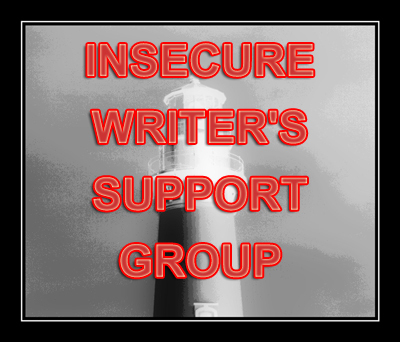 If you would like to join, just click here: Insecure Writers Support Group. We”d love to have you! I did something this past month that terrified me. I submitted my short story, “Damaged,” to Glimmer Train Press. I wrote it, rewrote, cut some, rewrote it, and cut some more, until it was about 756 words (It was an entry for the Very Short Fiction Award, which tops out at 3k, but can be any length shorter). Then I gave it to a good friend of mine, Bonnie, who will be forever in my debt, to crit for me. She told me what would work even better, and what didn’t work as well. By the time I was finished, it was still flash fiction, and I was a little worried about submitting flash to a literary journal, you know? But here’s why I stopped being afraid. The story is the story. To add to it falsely just to make it fit into a mold you think it needs to be, cheats the story, and – that’s not right. Not right for me, and more importantly not right for the story. I had shared the beginning of the story here with you all last month. It’s fictionalized, based on a true story. So I thought about using a pen name. Then I got braver and decided to use my real name when I submitted. It’s been a full week and the status of my submission is “in process,” which means it hasn’t been rejected. In past experience, if Glimmer Train flat-out rejects a story, it gets done within the first few days. They’ll notify us by Oct. 1st, unless we’re one of the 1st,2nd, or 3rd place winners, in which case we’ll get an email or phone call the week before that.